Daily Illuminator: New Resources For Car Wars: The Card Game! November 19, 2015: New Resources For Car Wars: The Card Game! 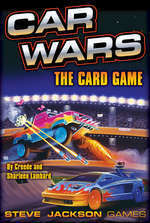 We've recently updated the page for Car Wars: The Card Game, adding some additional resources. You can now find a card list for the Third Edition and a downloadable PDF of the Third Edition rules. While we were there, we beautified and reorganized the page, to make all the info easier to find! Take a look and let us know what you think on the Car Wars forum! Car Wars: The Card Game is available now at your Friendly Local Game Store and Barnes & Noble Booksellers!